UNITED NATIONS -- Israel's Ambassador to the United Nations said Tuesday that the White House intends to move forward with its much-anticipated Middle East peace plan early next year, before expected Israeli elections. "We don't know the details of the plan but we know that it's completed," Ambassador Danny Danon told a small group of reporters Tuesday in his office near U.N. Headquarters. He said the Trump administration has told the Israeli government that it is prepared to roll out the plan in early 2019. President Trump's son-in-law and senior adviser Jared Kushner, and White House Middle East envoy Jason Greenblatt, have been drafting the Trump administration's long-awaited plan for a peace deal between Israel and the Palestinians, and they have touted its preparation several times since the White House's recognition of Jerusalem as Israel's capital on Dec. 6 and the opening of the new U.S. Embassy there in May. The date for Israeli elections is not set, but Danon predicted a vote would likely be called for May or June. That would mean "a window of opportunity for the administration to present the peace plan" in early 2019, he said. U.S. Ambassador to Israel David Friedman has cautioned the Trump administration's Middle East team, including Secretary of State Mike Pompeo and National Security Advisor John Bolton, not to roll out the White House plan at a time that would in any way interfere in Israeli elections. Danon said it would be "horrendous" if the White House decided to present its proposal during the Israeli election campaign. He added that if the Trump administration doesn't present the plan soon, there will not be another opportunity until next fall when there is a new Israeli government. "We know that there will be parts that we will like, there will be parts that we don't like… but we will be open-minded. We will be willing to negotiate, to speak about everything," Danon said, adding that the United States is working to bring Egypt, Jordan and Saudi Arabia into the peace effort. "I think one thing is for sure, the Palestinians are suffering today, the people," Danon said. 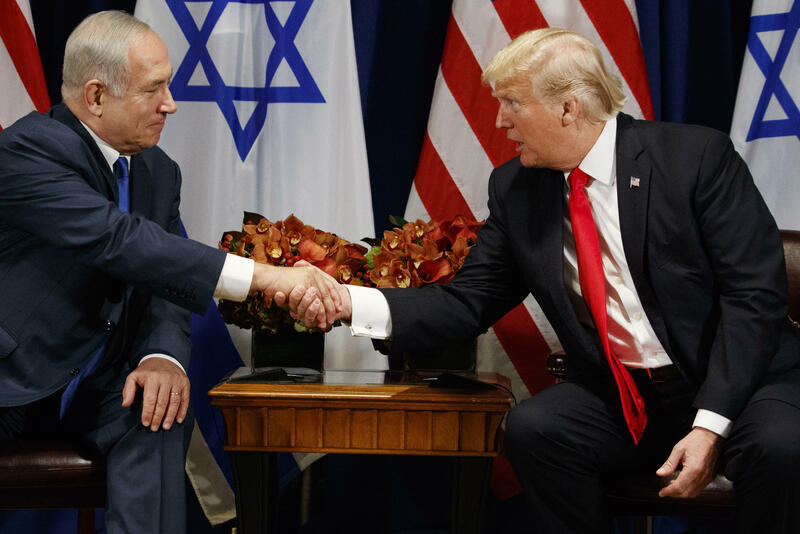 Speaking in September, in remarks at the U.N. alongside Israeli Prime Minister Benjamin Netanyahu, President Trump said achieving a meaningful political solution to the decades-long Mideast crisis during his first time was, "a dream of mine. Israel has been working to improve relations with Arab nations. Two weeks ago, White House envoy Greenblatt wrote: "There are now multiple examples of thawing relations between Israel and its neighbors." On Tuesday, Greenblatt said in a Tweet that it is "time for change -- great to see some Arab leaders recognizing this." It is "unfortunate," Danon said, that the Palestinians do not seem ready to engage on the plan. On Thursday the U.S., with Israeli support, will test the waters. In the afternoon, the U.S. has scheduled a vote at the U.N. General Assembly on a resolution that supports peace efforts and condemns Palestinian militant group Hamas, which controls the Gaza Strip. According to Danon, the U.S. administration, and Ambassador Nikki Haley in particular, have been working with the European Union and other regional blocs to garner votes for a measure that condemns Hamas as a terrorist organization. From the time Haley arrived at the U.N. in January 2017, she has made a point of trying to turn the tide of what the Trump administration considers to be overwhelmingly anti-Israeli resolutions. "There is no specific reason why now," Danon said about the U.S. plans for a General Assembly resolution. "My approach at the U.N. is we should not say, 'let's ignore it, we are losing no matter what' — I believe we can change the U.N."
"Many people in Israel are very skeptical about the U.N.," Danon added, "but we need the U.N. — but we need to change it and push it in the right direction. That means condemning Hamas, not 20 resolutions condemning Israel." The draft resolution, obtained by CBS News, is still likely to be revised before the vote that will take place after a General Assembly debate, probably Friday or Monday. It supports a "lasting and comprehensive peace between Israelis and Palestinians" and condemns Hamas for "repeatedly firing rockets into Israel." It also "condemns the use of resources by Hamas in Gaza to construct military infrastructure." The U.S. is negotiating the language with the European Union, Danon said, encouraging the parties to "find common ground." The draft applauds the mediation efforts of Egypt for "intra-Palestinian reconciliation" (between Hamas and rival Palestinian faction Fatah), encourages "steps to reunite the Gaza Strip and the West Bank under the Palestinian Authority (Fatah)" and supports the efforts of the U.N. Secretary General and the Special Coordinator for the Middle East Peace Process. Last month at the U.N., Palestinian U.N. envoy Ambassador Riyad Mansour wrote a letter to the then-president of the Security Council, saying, "What we demand — an end to this occupation and historical injustice — is no more than a call on the international community to respect and defend the universal principles and moral standards that it has itself developed and accepted as basic canons, all of which are in grave jeopardy at this critical moment." In mid-November, Palestinian Authority President Mahmoud Abbas, who has rejected the White House proposal of a peace plan and frozen negotiations since the U.S. recognized Jerusalem as Israel's capital, said: "We will remain on our land and continue to act. We adhere to our principles. Our flag will continue to be raised on the walls of Jerusalem." Mansour had no immediate comment on the record about the current draft resolution, although he is scheduled to speak at a U.N. meeting Wednesday. U.N. meetings entitled "Special Meeting of the Committee on the Exercise of the Inalienable Rights of the Palestinian People in observance of the International Day of Solidarity with the Palestinian People" are set to take place Wednesday through Friday, including the introduction of four other draft resolutions, Ayis wrote. Danon said European Union countries were deliberating on the proposed resolution on Tuesday at the expert level, with the ambassadors involved behind the scenes. The U.S. is now negotiating the language of the resolution with European Union countries, Danon said, noting on Monday after a meeting with Haley that the U.S. delegation was not presenting its language, "take it or leave it." "We hope they will achieve common language. For us it is very important symbolically to have EU's support officially on that Resolution," Danon said. Danon said he expects the EU to support the Resolution: "When you look at the language of the Resolution, it's reasonable, it's focused on condemning Hamas, it's calling for peace in the region, it's not taking sides."